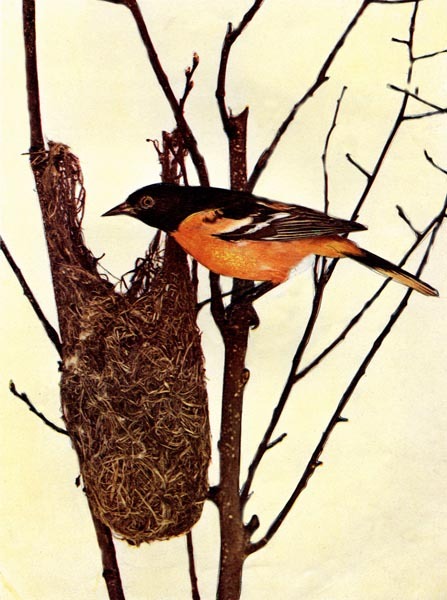 Baltimore Oriole for Birds Illustrated by Color Photography, 1897, From Col. F. M. Woodruff. ALTIMORE Orioles are inhabitants of the whole of North America, from Canada to Mexico. They enter Louisiana as soon as spring commences there. The name of Baltimore Oriole has been given it, because its colors of black and orange are those of the family arms of Lord Baltimore, to whom Maryland formerly belonged. Tradition has it that George Calvert, the first Baron Baltimore, worn out and discouraged by the various trials and rigours of temperature experienced in his Newfoundland colony in 1628, visited the Virginia settlement. He explored the waters of the Chesapeake, and found the woods and shores teeming with birds, among them great flocks of Orioles, which so cheered him by their beauty of song and splendor of plumage, that he took them as good omens and adopted their colors for his own. This Oriole is remarkably familiar, and fearless of man, hanging its beautiful nest upon the garden trees, and even venturing into the street wherever a green tree nourishes. The materials of which its nest is made are flax, various kinds of vegetable fibers, wool, and hair, matted together so as to resemble felt in consistency. A number of long horse-hairs are passed completely through the fibers, sewing it firmly together with large and irregular, but strong and judiciously placed stitching. In one of these nests an observer found that several of the hairs used for this purpose measured two feet in length. The nest is in the form of a long purse, six or seven inches in depth, three or four inches in diameter; at the bottom is arranged a heap of soft material in which the eggs find a warm resting place. The female seems to be the chief architect, receiving a constant supply of materials from her mate, occasionally rejecting the fibers or hairs which he may bring, and sending him off for another load more to her taste. Like human builders, the bird improves in nest building by practice, the best specimens of architecture being the work of the oldest birds, though some observers deny this. The eggs are five in number, and their general color is whitish-pink, dotted at the larger end with purplish spots, and covered at the smaller end with a great number of fine intersecting lines of the same hue. In spring the Oriole’s food seems to be almost entirely of an animal nature, consisting of caterpillars, beetles, and other insects, which it seldom pursues on the wing, but seeks with great activity among the leaves and branches. It also eats ripe fruit. 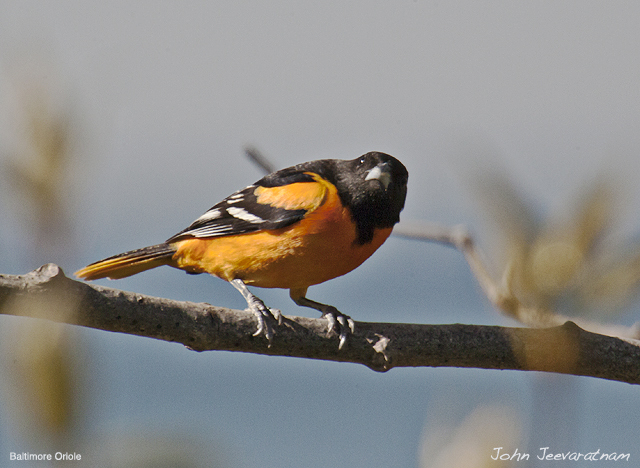 The males of this elegant species of Oriole acquire the full beauty of their plumage the first winter after birth. The Baltimore Oriole is one of the most interesting features of country landscape, his movements, as he runs among the branches of trees, differing from those of almost all other birds. Watch him clinging by the feet to reach an insect so far away as to require the full extension of the neck, body, and legs without letting go his hold. He glides, as it were, along a small twig, and at other times moves sidewise for a few steps. His motions are elegant and stately. About the middle of May, when the leaves are all coming out to see the bright sunshine, you may sometimes see, among the boughs, a bird of beautiful black and orange plumage. He looks like the Orchard Oriole, whose picture you saw in May “Birds.” It is the Baltimore Oriole. He has other names, such as “Golden Robin,” “Fire Bird,” “Hang-nest.” I could tell you how he came to be called Baltimore Oriole, but would rather you’d ask your teacher about it. She can tell you all about it, and an interesting story it is, I assure you. You see from the picture why he is called “Hang-nest.” Maybe you can tell why he builds his nest that way. The Orioles usually select for their nest the longest and slenderest twigs, way out on the highest branches of a large tree. They like the elm best. From this they hang their bag-like nest. It must be interesting to watch them build the nest, and it requires lots of patience, too, for it usually takes a week or ten days to build it. They fasten both ends of a string to the twigs between which the nest is to hang. After fastening many strings like this, so as to cross one another, they weave in other strings crosswise, and this makes a sort of bag or pouch. Then they put in the lining. Of course, it swings and rocks when the wind blows, and what a nice cradle it must be for the baby Orioles? Orioles like to visit orchards and eat the bugs, beetles and caterpillars that injure the trees and fruit. There are few birds who do more good in this way than Orioles. Sometimes they eat grapes from the vines and peck at fruit on the trees. It is usually because they want a drink that they do this. One good man who had a large orchard and vineyard placed pans of water in different places. Not only the Orioles, but other birds, would go to the pan for a drink, instead of pecking at the fruit. Let us think of this, and when we have a chance, give the birds a drink of water. They will repay us with their sweetest songs. The Baltimore Oriole is in the Icteridae – Oropendolas, Orioles & Blackbirds Family. They are slimmer and smaller than an American Robin. This bird received its name from the fact that the male’s colors resemble those on the coat-of-arms of Lord Baltimore. Like all icterids called ‘oriole’, it is named after an unrelated, physically similar family found in the Old World: the Oriolidae. 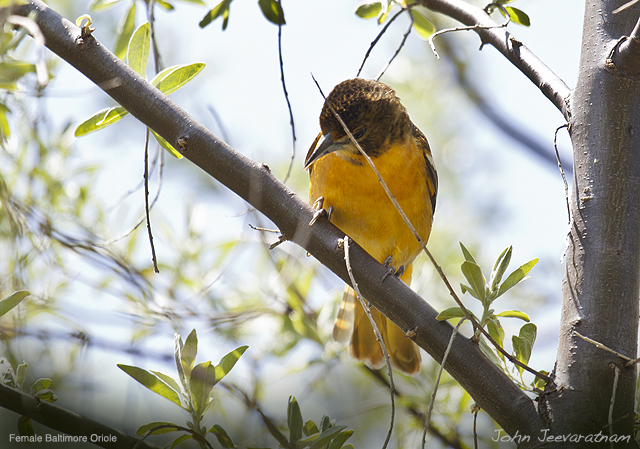 At one time, this species and the Bullock’s Oriole, (Icterus bullockii), were considered to be a single species called the Northern Oriole. The male oriole is slightly larger than the female. Adults have a pointed bill and white bars on the wings. The adult male is orange on the underparts, shoulder patch and rump. All of the rest of the male is black. The adult female is yellow-brown on the upper parts with darker wings, and dull orange on the breast and belly. The Baltimore Orioles, a Major League Baseball team in Baltimore, Maryland, were named after this bird. It is also the state bird of Maryland. The male sings a loud flutey whistle that often gives away the bird’s location before any sighting can be made. Baltimore Orioles forage in trees and shrubs, also making short flights to catch insects. They mainly eat insects, berries and nectar, and are often seen sipping at hummingbird feeders. Oriole feeders contain essentially the same food as hummingbird feeders, but are designed for orioles, and are orange instead of red and have larger perches. Baltimore Orioles are also fond of halved oranges, grape jelly and, in their winter quarters, the red arils of Gumbo-limbo (Bursera simaruba). 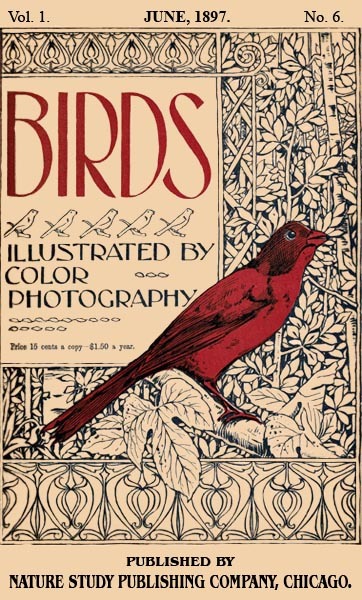 This entry was posted in Birds, Kid's Section and tagged Birds Illustrated by Color Photography, Birdwatching, Christian, From The Past, Home School, Icteridae, Kids, Oriole, Photography, Vol 1 #6 June 1897, Youth. Bookmark the permalink. And occasionally, we’ve had the Orchard come by as well.